Is Real Madrid's Mourinho the master of mind games? 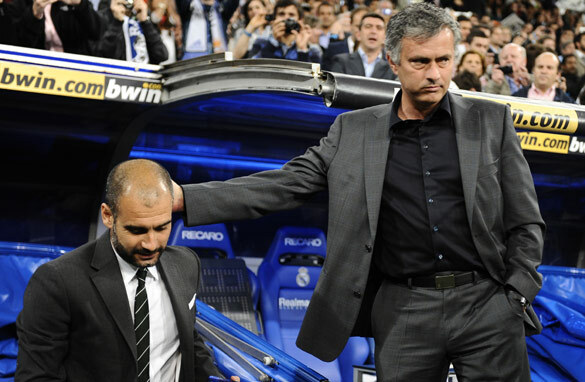 Mourinho (right) will be looking to get the better of Barcelona coach Pep Guardiola (left) in their next three meetings. Love him or hate him, but you certainly can’t ignore him. Jose Mourinho commands attention wherever he goes. He loves to be the center of attention and he proved it again before and after Saturday’s El Clasico against Barcelona. Leading up to the game, he decided not to talk to the media prompting journalists to walk out of a press conference by assistant Aitor Karanka. Following the battle at the Bernabeu, Mourinho refused to talk to reporters from the newspapers who had boycotted his colleague. Most people may believe Mourinho says and does controversial things just to grab the headlines. That is not the case. Those who think he is a loose cannon would have it all wrong. There is definitely method to his madness. I have watched Mourinho closely since his first season at FC Porto, and nothing that he says or does surprises me anymore. It amuses me incredibly, but it doesn’t shock me because I know this is a man who studies mind games and plays them better than anyone else around. What we need to understand is that in his life as a coach, Mourinho is acting out a role. Ever since he started his career as a manager, Jose decided that he was going to create an alter ego who would make an impact in the world of footballl. He decided he was going to play the role of a general who would lead his troops through thick and thin, doing everything necessary to win every battle. Mourinho set the tone early on in his career. Taking charge at Porto midway through one of the most tumultuous years in their recent history, he had the audacity to claim in his inaugural press conference that his team would be crowned league champions by the end of the following season. While his team won games on the pitch, Mourinho continued to talk a good game off it – a strategy that worked even better, perhaps, than he could have ever imagined. As promised, in his first full campaign not only did he go on to win the league but also added the Portuguese Cup and the UEFA Cup in what was a historic treble. In the following season, the coach added the Champions League title to his resume. When he moved to London, Mourinho upgraded the character he was playing. Under the bright lights of the English Premier League, the Chelsea manager definitely turned his game up a notch. Just a few miles from the West End, which is known worldwide for its plays and musicals, Jose put on a show. From announcing that he was the “Special One” to criticizing or entertaining anyone and everyone who was in his way, he clearly became the protagonist in what was a story of success at Stamford Bridge. Fast forward a few years and the Mourinho we see in Madrid is still very much the same. His philosophy hasn’t changed. It may have shifted slightly in order to fit in to a southern European mentality, but it is just as important as it has always been. He may have become more dramatic and more emotional perhaps, but the games are still the same. The role he plays is still to take most of the attention away from the players and place it on himself. As the pressure rises, so does the intensity of his actions and words, so don’t expect anything to change anytime soon. So, as the climax to Real’s season approaches, what can we look forward to? Definitely more mind games, more outrageous comments and more entertainment from the Portuguese general. He wouldn’t have it any other way. Definitely the master of mind games. I knew Mourinhou would destroy the Barca midfield when he refused to talk to the press. And yes we did see a show of brilliance from Pepe. Go Mou and prove to the world once more that Barca can be defeated!. Mourinho is a very good and obviously very successful coach. No doubt about that! But it really bothers me that in defeat he has never conceded that the opponent was actually better. Not even when Real lost 5-0 against Barca. In that respect Wenger and Furguson are similar, but Mourinho is the worst. I'm argentinian but I think that Mourinho is the better soccer coach ever exist!! I admire Mourinho so much. He has done, and will do, wonders at Madrid- Benzema being a prime example of this. I think people should only criticize if they've done half of what he's achieved. League, cup, and Champions League at Porto. League, cup, and Champions League runner up at Chelsea. League, cup, and Champions League at Inter. FIFA Coach of the Year 2010. Among more. No matter if you like his methods or not, you have to admit they work. He knows when the stakes are high, nerves chip in on the players. In this case mind games will always prevail. Go torment Barca! stupid, stupid, stupid, incredibly insane! I don't understand the news media obsession with this guy. He was employed at Madrid to play FOOTBALL not MIND GAME, OK? So far he is only playing legs and going around running his mouth, and yet they called him the best. WTF! yes he won the CL with Inter but anyone admiring his his style of football is either new to the game or has no taste of good football, period. Mourinho is really genius. His mind plays better than the feet of his players. What I hate about him, though, is he never demonstrate his appreciation to his opponents when he is outclassed. Barcelona players are capable of destroying any team. Yet, if there exists a team that can stop them, It is Mourinho's Real Madrid. Simply because he can beat Barca in a very odd and unpleasant manner, i.e. Negative football ! Will the special one get special treatment? Loose to Barcelona in the Champions League and cup and any other Madrid manager would be sacked. Mourinho gave Spanish journalists exactly what they deserve: as the worst in Europe, they have proved it time and again! Polanco has left an indelible stigma that cannot be shaken off. Will the Spanish media in sports and politics ever wake up to their legacy? It is even worse than Franco's propaganda, to say the least. Pedro Pinto is portuguese. I´m sure that Mourinho likes to be in the headlines and he is not humble! 1. Munrinho is a great planner: he take time to study his opponent's strength and weaknesses. 2. Munrinho imbibes the skills of a lion: when it is out to hunt down it's prey, patience and patience alone deliver it's prey into it's hands. 4. He will never use same weapon possessed by his opponent to attack. I must say that I like his methods. The man is a genious, who understand the game and studies the "what-ifs" of the 90 minutes like no-one else. Nobody gets where he is by pure luck! i believe madrid is going to copa de rey..
Agree with the article. He is the best coach in any sporting code and only the truly smart journo's understand him. He will rewrite the record books and we love watching how he defends his players and gets the team to perform. He will get Real to be better than Barcelona and then leave because they have treated him poorly. Yes, Pedro, but his mind games didn't win him the game did they? Barca got a draw AT the Bernebeu, and Real had to come from behind to even get that. So how succesful were his "mind games" when his team got just one point from a possible 6? I'm sure Guardiola and all Barca fans are happy for Mourinho to be as Zen as he wants if the next 3 games end up in draws or Catalan victories. Truly Jose Mourinho is a good coach but Pep Guardiola is better coach than Mounrinho and is now a special one....People should stop calling Mourinho a special one,Say the truth and the truth shall set you free...Pep Guardiola is the special one not Jose Mourinho...Bcuz Mourinho can never beat Pep 5-0 in Bernabu and come to Camp Nou and draw...people should take a good look at this.Pep Guardiola is the master and will continue to be Mounrinho master LOL. He's indeed a character,amusing one for that matter. I like everything he says and does. what is special about Mourinho? if there is somebody to be called special one then he should be Pep Guardiola not Mourinho, or is't because Pep doesn't talk too much? and again who gave him that name? he gave him self, he called him self the special one, and if there's something special i think is from Pep who beat Mourinho, him hans down, since pep start coaching he has meat Mourinho 6 times, he beat Mourinho 3 times draw 2 and loose one, they first meet in the champions league last season group stage, Mourinho draw with Pep in Milan and loose 2-0 in Barcelona, and again meet in the semi final, first leg in Milan, Mourinho won by 3-1, and the returning league in Barcelona he loose 1-0, and when he came to Spain their fist meet is La Liga he loose again by 5-0, and returning league in Madrid ended draw, now tell me who is the special one brtween the two? @musah fifa Well all that may be true but Mourinho is still the Special One!!! Barca fans just hate it that hes the reason they couldn't repeat history by winning the Champions League Two Times in a Row!!! True a great coach. I hate & admire him at the same time. Disagree......all these "mind games" are nothing more than media interest......cant see any connection with this and on field performance? yes a good coach...would he less successful if he did speak at press conferences? the media love him because it gives them something to write about. Not a master of mind games, just a d-bag. VISCA. I am die hard mourinho fun.I think he is miles and years ahead of his colleagues he is a living legend,every where he goes he breaks records. Watch out BARCA we are coming after you tomorrow. Mourinho has won trophies in 3 different countries with 3 different mentalities. 2 Champions League titles with 2 different clubs one of them with a very small budget (Porto). Several times national Champion in Portugal, England and Italy. UEFA cup, a bunch of cups from Portugal, England and Italy. Which coach in the World has managed to do this? WHich manager has won the Champions League and the UEFA cup with a budget as tight as he had in Porto? Alex Ferguson and Guardiola are without a doubt great managers, but in their own clubs and their own environment. To go out there out of your comfort zone and be able to win, there is not a lot of people in the World with this courage and excellence. Playing defensive tactics is what pedro is calling a good or mind game. Real madrid is a big team and we dont expect them to play a sit and wait game and depends on counter attack. Please let Mourinho teac them how to play a good fotball. Football is not only about winning . If all the coaches play or used the same tactics Mourinho is using, then is better to stop watching football ,because all matches will end up draw and becomes more boring to watch. Thanks to barcelona, thats why many people are watching football. Thanks Pedro for your blogs on Jose. I can't get enough of this guy, i don't care what ever his haters say, to me he is the most entertaining manager in football that ever live. Long live Jose and to hell w/your haters. First, to be frank, I am a Barca fan for many years, so my criticism should be taken in that context as well. I think "Mou" is a great coach. The record 9-years without losing a home game is simply staggering. Of course, he has also won major awards with several teams. These alone make him one of the greatest coaches of all times. However, that's where my praise ends. His whole attitude in Football is anything but what I enjoy about the game: He is arrogant, self-absorbed, a cry-baby, and while some people may enjoy the "color" he adds to the football world, I much prefer coaches who preach humility and respect like Pep Guardiola, not to mention the fantastic attacking Football of Barca which made me such a great fan of that team in the first place! Playing defensive is what we call mind games. Madrid is a big team .We dont expect Mourinho to play like that, let him train Madrid how to play good fotball, even if they are losing. Football is not only about winning or playing for draw. cruyff: mourinho is not a football manager..
a portuguese writing about another portuguese??? "The football Barcelona played at the Bernabeu was simply brilliant. Their superiority was clear," said Di Stefano, reports Sport.es. "Madrid played against a Barcelona side who dominated throughout the whole game. It's clear Barca are superior to Madrid who are a team with no personality. "Their approach was clearly wrong." Well, Mourino is a great coach but he need to prone his arrogant character. Let him learn from the greater coaches like Alex Faguson , Pep Guadiola and Arsen Wenger. It's very important. Mourinho is a joke. Like Cruyff said: a prize-fighter, not a football coach. What is good football? the end result is what makes the difference in football. Mourinho is a STAR any where he goes. So, Mourinho's "mind games" delivered the Copa del Rey, but I think the Meringues might just have teed themselves up for a Champions League drubbing, and that's what Jose should have on his mind right now. Arti you are wrong. When he lost 5-0 against Barcelona he admitted that the other team played better and deserved the win. Firstly, let no one forget that all sports including football are a form of entertainment and this could be provided by any member of the team (including the coach) and this could be done on or off the pitch. Having said that i believe that JM is arrogant, proud and a very sore loser and ..... but he is an excellent football coach. Football like most team games is unlike chess in that is has a lot of tactical underpinnings and if you don't know that then you do not know football at all. At the level of CL, La Liga & Copa del rey (include the WC, Euro cup and African nations cup in that list...) it is strictly not about entertainment but about winning. To win in football you really don't have to entertain if you can't but you plan to score more goal(s) than your opponent. Currently there is no team in the world that can defeat Barcelona by playing an open, expansive and entertaining type of football (Just ask arsenal and wenger!) and it is not only illogical but suicidal to try and defeat your opponent by playing a game that he is better than you at. YOU JUST CAN'T WIN. Jose Mourinho is simply the BEST!! The way he plan his GAMES is superb – that's how people win in this world. Keep it up Mr. Especial – you deserve this title. Genius Mourinho!!!! Mr Cryuff u were the better player of your time...but not a better coach as the GENIUS on the block. @Abiodun i agree with you 100%, i hate Mourinho very well but for yesterday's match i gave him plus for his tactic, because if you watch the game very well then you will give Mourinho plus, although am Barca fun but we have to said the truth that mourinho is better than Pep Guardiola because if it's Mourinho that have the team of Barcelona he would have destroy that of Madrid,so for that i gave Mourinho plus, kudos for Mourinho and Real Madrid. Errr We all forget one important detail, Mourinho's biggest asset is not his mind games or technical knowledge which no doubt he got in abundance, it is the fact that he always coaches the most expensively asssembled club in any country he goes (FC Porto, Chelsea, Inter Milan, Real madrid ) In the final of the copa del rey, Guadiola had no foward on the bench while Mourinho had 3 ! Sorry, the Wengers and the Guadiolas will always be the best for me. The great World Cup teams of West Germany and Italy always put more importance on defense. That's how they gained recognitions as great teams and great soccer nations, and won World Cup many times. Jose Mourinho is doing a fantastic job at Real Madrid. Give the man the respect he deserves. Gracias! Like it or not Mourinho just makes things happy. comments and statements as he frequently does but they all serve a purpose. The bottom line is that he for sure is entitled to the moniker The Special One. Could he be Alex Ferguson's successor? I like soccer and what the coach of Real Madrid is doing is absurd.Luckily sometimes he has the man who is in charge of the game on his side.If you take a good luck at Real Madrid you will see that this team is not a whole.They are individuals.They are not playing soccer.They are hunters.They are on the pitch simply to destroy players.The method of the coach of Real Madrid is simple: it does not matter how you win a game you just have to win.And if necessary by any means.Look at Pepe for example: he just runs like a dog give Messi "the punta pie.It is just disgusting.But in the end it will all be good.Real got their price and believe me,this will be the only one.did you see how it fell of the bus an d got demolished.The dream is starting to become a nightmare.Talk to me in the final. His tactics are boring... I don't like him. I dont understand how playing solid defensive and swift flowing rapid counter attacking football is ugly football? To me the counter attack is just as beautiful as any other football tactic if not more beautiful. Barca's possession and attacking football is beautiful football but to play to Barca's strength is utter stupigdity. And Mourinho is not stupig, he is a genius. Let's see Barca remain true to their kind of so called beautiful football and keep on losing to Mourinho and dont change their original style to stop the bleeding. Then I say Barca is a courageous team true to their convictions. If not and they stop playing their possession attack game to stop losing to Madrid, then Barca and all their fans are true hypocrites. Mourinho has been a very good fooball coach all these years,but what he's playing currently with R.Madrid mostly against Barcelona isn't football,it's absolutely "RUGBY"...If he play Barcelona the way he played Valencia it will definately be a beautiful game to watch..If he(Mourinho) continues with this Rugby style with his players,I wonder where it will lead them after he's left..
No, Mourinho is not the master of mind games. He is the master of Anti-Football, the kind that we don't need for the beauty and the good of the game. He's killing the sport and the reasons why we go to the stadiums or why we sit in front of the tv to watch. It's a shame that Real Madrid, with all its past glory and talented players and coaches through its history is playing like a little team, one with no personality and with fear in their eyes. They are more like a group of hit and run guerrillas appealing to dirty warfare rather than a professional army fighting with pride and courage. Indeed Jose is good,but against barca he is a distant second,lucky he got away with the kings cup,he will draw tomorrow's cl first leg and loss to barca in the second leg.he does not have the courage to play good football.football is changing you cant always win with negative football. He is, by far the best coach in the world. Defensive? Yes, when he has to!! But Real scores more than 3 goals in 50% of its matches. Only a stupid coach will use an offensive tactic agains Barça. He tryed it and lost 5-0!! An inteligent coach adapts his tactics depending on who the adversary is. I want to see Guardiola winning the Champions and the UEFA cup with a portuguese team, plus the tittles for Chelsea and a "Triplete" with Inter Milan. Guardiola just took the team from Cruijff and added Villa! How can you loose with Messi, Xavi, Iniesta, Piqué, Valdez, playing together for how many years?? are you kidding me? are there really that many people that like mourinho? he complains so much about ANY ref, the only time he shuts up is when they win a game. he is not noble or humble, or respectful. i don't care if it's mind games. As a madrid fan i will really appreciate it if the football world focuses more on the game between real and barca than on coach mourinho..he has a lot of work to do to get back in the game in the return leg in camp nou next week..he needs all the time and space to re-set his team and lead them to victory..not giving press briefings..
Senhor Jose Mourinho has plenty of stamina for coaching. Football needs such characters to make the game broad based. talk here,talk there some of the talks are not even resonable(sorry to say)bt i think some people do no watch or know good football.Gorch for crying out loud pep coaches 1 of the best type of football a coach can ever coach.Where as mourino can't coach a team like madrid,because madrid's players are not that strong like chelsea or inter.A team like madrid needs strategical coach like frank reigkard,pep gadiola etc than mourino after or even pep gadiola won both uefa,laliga & every other league that came his way on his 1st season in barcelona. Mourinio is a fool and will be remembered as such. He has overplayed his hand in destructive "football". He is going down now. Talk about real and good coach and you have Sir Alex Fergurson . The longer you stay with a club and the more the team improves makes you a good coach . Ask me for more details.